I have been a believer for one year. “The Gate to Life” has really helped me understand the meaning of the Bible. It helps me to be fully devoted to the Lord and worship the Lord. I am now sharing the Gospel with others. 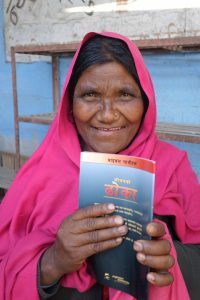 MediaServe has provided close to 100,000 New Testaments in Nepal. One pastor told us how they invited over 12,000 people to a Christmas celebration last year. About 4,000 people came and 400 accepted Christ. All 400 received a New Testament and have been added to the church! 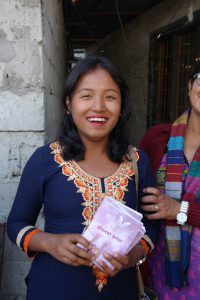 Another church which received New Testaments from us is pastored by a former Hindu priest. Twenty years ago, someone visited his remote village and gave him a Gospel tract. He was so gripped by what he read that he wrote to the people who had produced it. He soon came to Christ. Him and his family were expelled from home and they had to live in a small hut at the edge of the village. This former priest started giving water to people passing by and shared about the One who gives Living Water! Soon people started coming to faith in Jesus and a church was planted. Now that church has planted 18 other churches in the area. It all started with a little booklet that presented Jesus! Despite the anti-conversion law enforced in Nepal last year, it was very encouraging to see how the church is being wise but not silenced. They continue to boldly share the Gospel. MediaServe is committed to help the church in Nepal and the focus is teaching material! Would you consider contributing to this?